Ex-world heavyweight champion Wladimir Klitschko has called for changes to how boxing is organised at the Olympic Games, to protect the sport's future. Boxing has been included at every Olympics since 1920, but its involvement in Tokyo 2020 is in doubt. "For the first time ever in boxing, the worst had happened," said Klitschko. "We need a combined effort to protect life-changing dreams of athletes who want to participate in the upcoming Olympic Games," he added. The International Olympic Committee (IOC) has threatened the move if amateur boxing's governing body, the International Boxing Association (AIBA), does not improve internal governance and address finance and anti-doping issues. Klitschko, 42, wants the World Boxing Association (WBA) to replace the AIBA as the federation responsible for organising the Olympic boxing event. "In an unprecedented shift that would rock athletics and the Olympics, boxing is in danger of being halted due to current dysfunction leading to losing the Olympic licence," said Klitschko, who won super-heavyweight Olympic gold at the 1996 Games in Atlanta. "I'm pleading with the national federations to continue signing with the pioneers of boxing, the world-renowned WBA. "I'm also asking the IOC to consider the WBA as the organisation that will centralise the sport, while continuing to improve the protections and interests of its athletes and fans, and grant the Olympic licence to the WBA to represent the sport for the upcoming Games in Tokyo." Klitschko, who held world heavyweight titles as a professional from April 2006 until November 2015 when he lost to Britain's Tyson Fury, said his win in Atlanta was a "life-changing event for me, my family, my country, my sport and possibly the globe". He later auctioned off the medal for $1m for charity. It is now on display in a museum where he says it acts "as a motivation for young visitors to become champions in sport and, more importantly, in life". 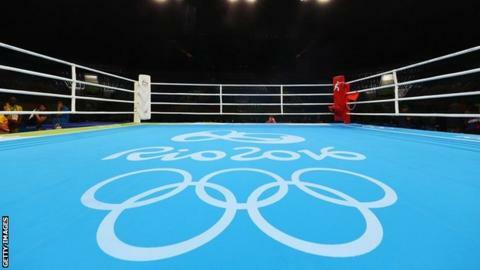 BBC Sport has contacted the IOC, WBA and AIBA for comment.